How many of you knew when you saw the title that I would be reflecting on the story of Shadrach, Meshach, and Abednego? One source I read called this story a farce, with everything so exaggerated as to make it ridiculous. As I was reading it I found myself almost laughing at the repetition of the whole list of different officials or the long list of instruments. Farces are fun, but as you are aware the best political cartoons while farcical are very telling. This story is certainly one of the saving power of God it is also a story about three heroes who stood up for what they believed despite potential dire consequences! This story is from the time of the Babylonian exile. The king at the time was Nebuchadnezzar II. At that time the Babylonian empire had control of vast areas from modern day Iraq, some of Persia, the Holy Land, and , at its height, all of Egypt. It was impossible for one man to rule such a vast area so Nebuchadnezzar had scores of governors, and lesser officials each with their own authority and territory and one of them was Daniel. After having a dream interpreted by Daniel the king was very happy and granted Daniel’s request to appoint his three friends Shadrach, Meshach, and Abednego to high offices. We pick up here with today’s story. The king had a sixty cubit tall idol constructed and made a decree that everyone must bow down to the idol when they heard certain music (a long and specific list of instruments and the ensemble) and that anybody who failed to do so would be thrown “immediately” into the furnace. With the king’s decree in place some of the Babylonian officials noticed some people not bowing down as ordered. This information was passed on to the king, that some Jews were not complying and naming Shadrach, Meshach, and Abednego who had recently been raised to positions of authority (presumably over Babylonians). Despite the edict saying they would be immediately thrown into the furnace, the king had the men brought to him. They were questioned and then they were given a choice of following the decree or being thrown into the furnace. They answered first that they didn’t need to defend themselves to him and then that they would not bow to the idol. Just saying that they didn’t have to answer to the King was a major thing, and the they chose the furnace! Furious the king had them bound by his strongest men, the furnace heated to seven times its usual temperature (again an extreme unlikely to be possible), and had them thrown in. The result was not what Nebuchadnezzar had expected. First his strong men who threw our friends into the furnace were themselves consumed by the fire. Then the king saw those three men, no longer bound and joined by another, walking around in the furnace. Taken aback he checked with others to confirm that he had indeed had three and not four men cast into the furnace. (the comic double take) Then he noticed that while the friends looked just as they had, the fourth man “had the look of a god”. Did these three men have a superpower that made them fire resistant? Of course not! Hananiah, Mishael and Azariah, their Hebrew names, went by the Babylonian names Shadrach, Meshach, and Abednego. They were exiles from Jerusalem, educated, thanks to the Babylonian schools, and friends of Daniel. Through that association they had been named as officials of the province of Babylon. With positions of power they were living well, and yet they were not free to go home to Judah. As God had instructed the exiles, they had built houses and planted crops and blended in with the population of the day. Unlike most of the Jews these three, and Daniel presumably, had not taken up worship of the gods of their Babylonian captors. For the most part furnaces are used in metaphorical ways in the Bible to represent a variety of things such as; God’s judging and testing, a refining fire to strengthen or to reform the people of Israel, and to represent the presence of God. We also associate that kind of fire with condemnation, like the fires of hell. The type of furnace being referred to in the story is probably one for smelting and refining metals and would therefore be both large and very hot, though I doubt it could be heated to seven times its regular heat without it breaking down. Nor do I think it likely that they had a furnace so large that four grown men could walk around in it. So what was the superpower that these three men shared? What was it that made them heroes? Their superpower was the conviction of their faith. They chose the fire, not because they assumed that God would save them, but because they would not break faith, they would not deny the god of their ancestors. They were what some sources call catalyst heroes. In a way like mentors, they acted heroically but they didn’t change much themselves, rather they brought about change in others. In this story the other is Nebuchadnezzar who, though not giving up his gods, comes to acknowledge and respect the God of Abraham as the only god who could have delivered in this way (Dan 3:29). In terms of the author’s purpose for this story it seems likely that the story of Shadrach, Meshach, and Abednego was used as a catalyst to change the Jews to return them to the worship of the Almighty God. While the steadfastness of our heroes’ was a catalyst to change, it was of course God himself who protected them from the fire in the furnace. Unlike Nebuchadnezzar God doesn’t really need us to worship him as without us he still has the whole of creation to praise him. As to his fiery furnace, we read in the Psalm this morning that God’s fire consumes his adversaries. Our heroes firmly stood on the ground of, and then were cast into the fire for the Almighty God not because they trusted that he would save them, but because they believed that he was the one true god. 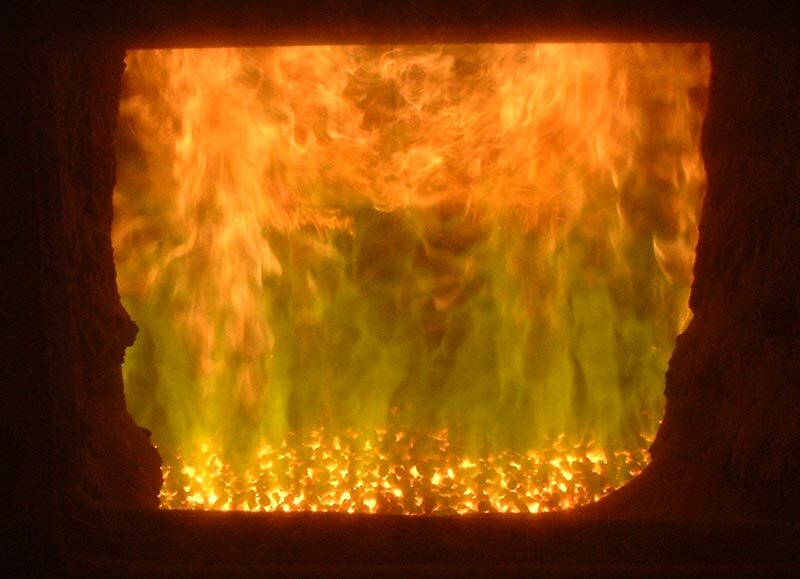 Nobody enjoys the furnace, the refining process. But when we find ourselves being coerced into worshiping other things let’s join Shadrach, Meshach, and Abednego in jumping from the frying pan to the fire! At school today the kids in one class got talking about Christmas decorations around their homes. Some said that their parents, mostly mothers, put their decorations up in November, while others said trees go up on the 23rd of December and come down on the 25. The thing that remains the same is that for people who celebrate Christmas, either for secular or religious reasons, do some kind of decorating. We aren’t done decking our halls at home yet. 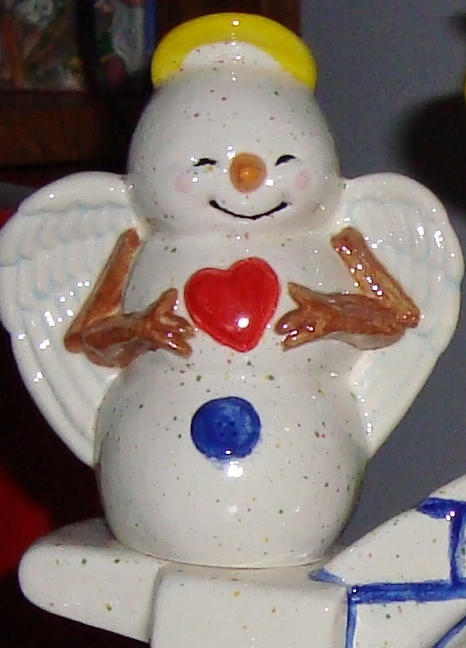 I have many of my nativities, some snowmen, some Santa figures. Some of the things used to belong to my grandparents, some to my husband’s family, and the nativity above represents months of work and enjoyment painting at a local Clay Cafe. Almost all the decorations have some deeper meaning or pleasant family related memories that go with them. Regardless of what form your “boughs” take, I hope that as you deck your halls it is with a sense both of family history and hope for the coming kingdom! My wish is to have peace and taking part in a Reiki experience has given me this sense of peace and serenity. My last two experiences have been quite different from my earlier sessions. During these session I encountered my angel. Initially, I saw two glowing lights moving around each other as if they were playing joyfully with one another. I felt happiness and an immense sense of joy, an almost childlike sense that only the present moment mattered. From the lights, a presence developed as an outline. The outline gradually became more visible until I could see a hooded figure there with me. I could not see his/her face. During this time I could see part of a wing that was a vibrant white in color. The energy that was present was very strong and real. I can’t remember much else regarding this encounter but the feeling that I wasn’t alone. It was as if I was at another level compared to the earthly one. The message that came from this was to enjoy life, have fun and laugh. And more importantly, that I am not alone because my angel that is a very strong one at that is with me at all times. This in turn gives me strength during my spiritual journey called life. Is it possible that this other level is the spiritual parallel place of holiness? Angels, are they real? I’ll look into this in a future post with help/reference to Calvin’s Institutes. Angels? What should we call them if we meet them? Angels fascinate us. Who can resist those little cherubs in the Christmas pageants, or the glowing tree toppers? Calvin makes points on nine issues about Angels in the first volume of The Institutes. I’ll look at three of these in this post. God is Lord over all! The designation of the angels in Scripture. No matter how interesting angels are, they are neither God, gods, nor humans. Calvin points out that since the nature of angels is overwhelmingly good, it seems that they should not have to be under anyone’s control, maybe not even God’s. But if they are not under the authority of God that would make them equal with God. Like us, they are creatures of God’s creation. In the Nicene Creed God is called, “the Creator of all things visible and invisible.” The mention of invisible is important and deliberate. We do not pray to angels, nor do we pray through them. God alone is God! Calvin’s next section reminds us of the importance of keeping ourselves from indulging our imaginations unduly. If you think this is unlikely, look at what we have done with the Christmas story. We have added any number of subtle touches to the actual story as told in scripture. 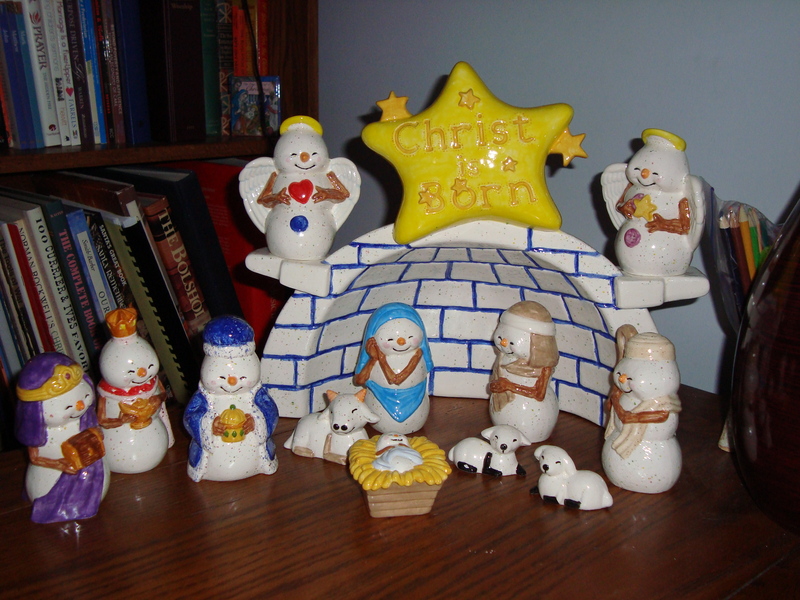 We have added all kinds of details about the Wise Men, or Kings. We have variously given them camels and horses for transportation. We have added to the animal count in the stable and made up lots of details about the stable as well. We have added halos over the heads of Mary and Jesus, and we have cut the time frame considerably when we depict the shepherds and wise men in the same scene on the night of his birth. Take a look at some of the movies and television shows we have which are based on the idea of guardian angels; the Christmas season classic It’s A Wonderful Life has taught us all that angels need to earn their wings and that when they do a bell rings; the tv show Touched by an Angel continues the idea of the guardian angel taking direct action in our lives; Angels in the Outfield; Michael; The Preacher’s Wife; Teen Angel; City of Angels; Saving Grace; and on top of all that, there are all those based on the fallen angel concept. If we want to learn about angels we need to stick with scripture and leave our imaginations at the door. The final point I’m going to look at today is that of the designations of angels. We have heard of Cherubim, Seraphim, archangels, heavenly hosts, messengers. Calvin also points out that they are also referred to as virtues, principalities, powers, dominions, thrones, and gods. Many of these later designations make sense, like virtues and powers, but dominions, thrones and gods seem a bit less likely. I’ll look into dominions, thrones, and gods in an upcoming post. 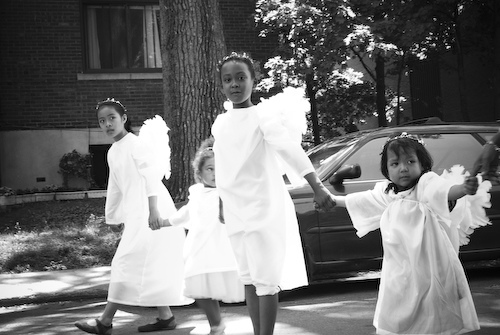 The other day I reposted Mary’s Angels: “I Am Not Alone” with the plan of finally getting around to looking at the question of angels as guided by Institutes of the Christian Religion by John Calvin. In my friend’s story she said, “I encountered my angel.” While Calvin talks about the fact that angels have been charged by God to watch over our safety, direct our ways, and take care that some harm may not befall us, there doesn’t seem to be any indication in scripture that we each have our own angel assigned to our cases. The angels protect the people who fear God, the believers. They do so in many ways which includes lifting us up when we are falling, but they also fight against the devil and our enemies in groups and Legions. Are the angels glowing lights, and shining figures with wings? Are they just a breath of inspiration in our minds? Angels, according to Calvin, are real separate beings. If they were just inspiration within us, then they would not rejoice over our salvation (Luke 15:10). They also appear as men in several instances in which they accept hospitality. So, what’s with glow, the halos, and the wings? If the angels can appear as men dressed in white and that sort of thing, where do we get this idea about wings and halos? In section 10 Calvin makes a clear case that God’s glory does not belong to angels. If this is the case why would they need wings? God’s glory makes it so that it is unsafe for us to look on him directly. When we read the Christmas story we hear about the glory of the Lord shining around them and the shepherds being afraid. God doesn’t need for the angels to glow or have wings. There is nothing he couldn’t do without the angels. We are the ones who need them to glow, we need them have wings…It is because of our weakness, our fear that we assign these characteristics to the angels. Is Christmas Supposed to be Exhausting? 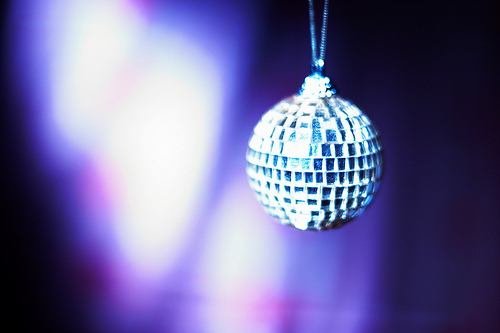 In the weeks leading up to Christmas, many people feel all kinds of pressure. Some worry they won’t be able to get the finishing touches done, some struggle with choosing the perfect gift, while many struggle with being able to provide anything special at all. There are issues of excessive commercialism struggled with as well as efforts to find lost spirituality. With all this we wonder why it is so hard, what we are doing wrong? As I lay there, mind open to God, it occurred to me that maybe we are meant to reach Christmas Eve physically and emotionally tired, worried, and all but hopeless. I realize the idea seems strange, but stay with me. Mary was nine months pregnant. For the past several weeks it would have been all she could do to carry out the everyday tasks without becoming out of breath, her back would have been sore, along with other common issues of pregnancy. On top of this she had dealt with at least six months of gossip going around her community about her pregnancy. As a young, first-time mother I am certain that she wanted nothing more than to be at home with her mother and other family members around to support her through the birth of her baby. As the last days of waiting approached what did Mary hear? “Road trip!” Packing, planning, worry about finances and the dangers of the road, what fun! On the road from Nazareth in Galilee to Bethlehem, which depending on your source is 79 or 80 miles as the crow flies, Mary walked or rode their donkey for approximately three days straight. Presumably at some point on the last day (not in December incidentally) she began having contractions. Riding into Bethlehem she must have been weary, frightened, and when she got the news that there was no room for them I imagine she felt like giving up! *Of course, I realize that there are millions in the world who do not celebrate Christmas at all.